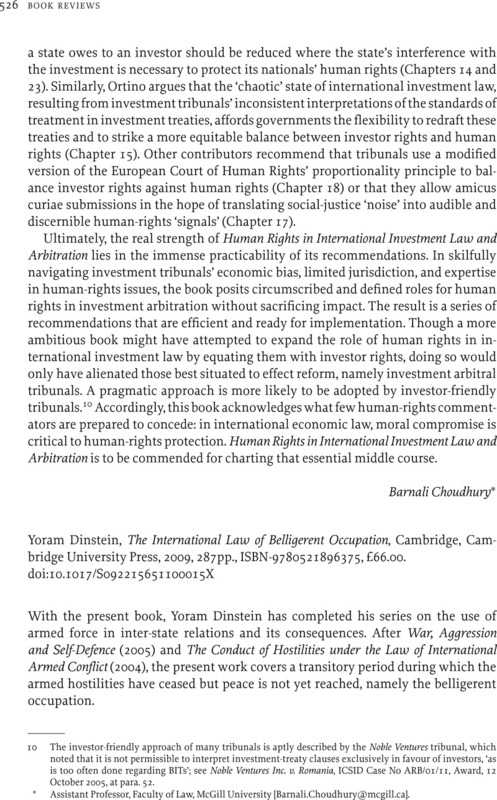 Yoram Dinstein, The International Law of Belligerent Occupation, Cambridge, Cambridge University Press, 2009, 287pp., ISBN-9780521896375, £66.00. 1 See the various reports of the expert committees of the Human Rights Council UN Doc. A/HRC/12/48, A/HRC/15/21, A/HRC/15/50, which all show smaller or bigger shortcomings when it comes to determining the legal standard. 2 For the different thresholds of the non-international armed conflict under common Art. 3 of the Geneva Conventions, 75 UNTS 35, 81, 135, 287, and Art. 1(2) Additional Protocol II to the Geneva Conventions, 1125 UNTS 609, see Opinion Paper ‘How is the term “Armed Conflict” Defined in International Humanitarian Law’, International Committee of the Red Cross, March 2008, at 3–5. 3 UN Doc. SC/RES/1483 (2003), SC/RES/1546 (2004). 5 United States Diplomatic and Consular Staff in Tehran (United States of America v. Iran), Judgment of 24 May 1980,  ICJ Rep. 3, at 34, paras. 69–71; Military and Paramilitary Activities in and against Nicaragua (Nicaragua v. United States of America), Merits, Judgment of 27 June 1986,  ICJ Rep. 14, at 54, para. 115. * Dr, iur., Maître en droit. Consultant in international law, Tel Aviv/Berlin [drohla@googlemail.com].